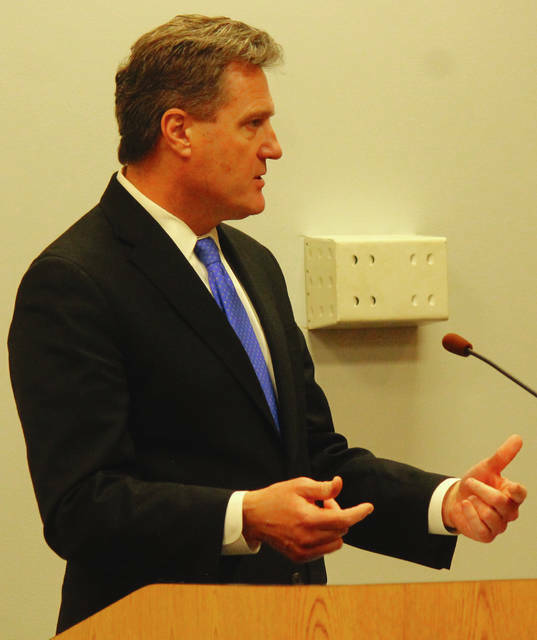 Anna Bolton | Greene County News Congressman Mike Turner attended a Greene County Board of Commissioners meeting March 29 to give an update on legislative actions that focus on the opioid epidemic and foster care. XENIA — Congressman Mike Turner focused on the opioid epidemic and foster care when he updated Greene County Commissioners March 29 on initiatives sparked by local activism. “As you know, we look to you for ways in which on the federal level we can change policies that affect our community,” Turner said to the board. Turner, who represents the 10th district, spoke about addicted individuals who become incarcerated and need access to treatment, an issue he credited as originally brought to light by the commissioners. “When we first become aware of an individual being addicted to opioids, it’s usually as a result of their incarceration or they’ve had some interaction with our police forces, our sheriff,” Turner said. According to the congressman, the structure of current federal funds means when a person becomes incarcerated and their Medicaid benefits end, they then have difficulty accessing Medicaid-funded treatment options. Turner said the president’s commission’s recommendations include changing the Medicaid provision, which means the issue might be resolved without legislation. The congressman also mentioned similar gaps in treatment for local babies born addicted to opioids. “These are the most fragile of our community and it is very tragic upon their birth as they have to transition from the addictions and then also to receive the care they need,” Turner said. Turner spoke of how Miami Valley Hospital and Kettering Health Network have implemented new programs to support specific treatment to aide babies in that transition. “The problem again though is that federal funds are restricted in their ability to be used so if a child is Medicaid-eligible and the funds are not there for the treatment, we have a bill that fixes that,” he said. Turner said U.S. Department of Health and Human Services (HHS) Secretary Alex Azar is working to address the issue. Lastly, the legislator talked about foster care, and how children who “age out” are often left in a homeless situation. But he said the issue must have the attention of two departments. While foster care is run out of HHS, housing assistance is run out of U.S. Department of Housing and Urban Development (HUD). https://www.fairborndailyherald.com/wp-content/uploads/sites/50/2018/03/web1_Turner-1.jpgAnna Bolton | Greene County News Congressman Mike Turner attended a Greene County Board of Commissioners meeting March 29 to give an update on legislative actions that focus on the opioid epidemic and foster care.